A brief definition of ADHD is that it is a brain-based deficit which results in an insufficiency in the ability to control attention. It is much more complex and presents itself in many different ways. However, the three hallmarks of any potential ADHD symptom is that it must be persistent, pervasive and impairing. Download the free Minding Your Matters ADHD Organizing Resource Sheet for more information. 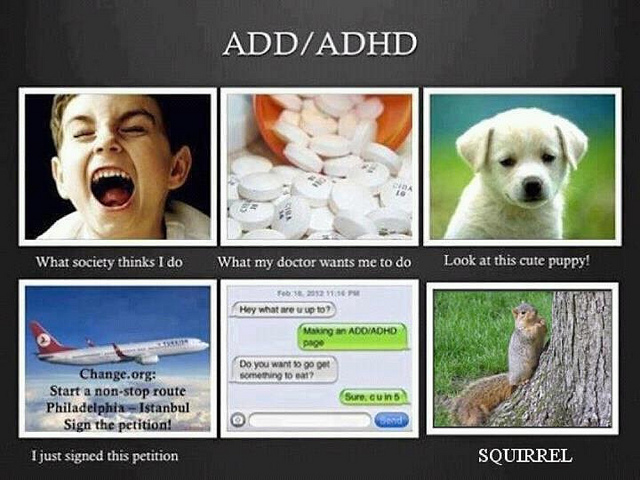 Please note: ADHD should only be diagnosed by a qualified professional. Here are some tactics that may be useful in increasing organization and productivity for your ADHD brain. An important “place” to develop awareness is “in the pause.” Since ADHD is the result of “mis-directed” attention, people with ADHD are challenged by keeping their attention on the most important stimulus of the moment. So they are working on a task and an email from a friend pops up. It’s much more exciting to connect with the friend, so all thoughts of the task leave. Someone with ADHD needs to work on identifying choices in that moment of a new stimulus. So when working on the task, consider the consequences of switching from the task to the email and then make a more informed choice. A brief pause can be very powerful. By the way, I’m not saying that the pause is easy! But that’s a topic for another article. Many people with ADHD experienced less than positive school experiences. I’m not suggesting going to school! I am recommending increasing your knowledge about ADHD — using accurate information. People can “move between” these different presentations. When getting diagnosed by a qualified professional, you’ll want to find out how the ADHD criteria specifically affect you. Keep in mind that ADHD can present very differently between males and females. In addition, how a factor impacts your life may change as you age and acquire new skills. You’ll also want to explore the crucial role of the executive functions. Everyone needs them. Unfortunately, people with ADHD have challenges with their executive functions performing accurately and consistently. So processes like working memory, sense of time, emotional self-control and self-activation, which help us manage the complexity of life, don’t fire on all cylinders and you may be prone to disorganization, forgetfulness, procrastination, and the like. Keep in mind that just because the label says “x”, “x” may not be true for you. For instance, 12-hour doses may or may not really last 12 hours for you. Work with an informed doctor and don’t be afraid to try a variety of medications in different doses until you find what works best for you. Not everyone chooses to use medication as part of their ADHD management strategy. It is a very personal choice. A large part of successful ADHD management is creating a support team. In addition to your diagnostician, physician, and medication, you may want to include an ADHD coach, an organizer trained to work with people who have ADHD, and a counselor. I’m not saying that you need to work with all of these people on a regular basis. You’ll have distinct needs in times of your life. Reasons you may need support personnel include establishing routines and an optimal physical environment. They may also assist in creating individualized strategies and methods of collaboration or delegation. Other people can provide accountability. While everyone benefits from sleep, exercise and wholesome food, they are even more important for people with ADHD. It’s easy to get hyper-focused on an activity and not get to sleep at a decent hour. It’s just as simple to ignore the alarm because of a lack of excitement in your daily schedule. However, the ability to complete complex tasks is related to your energy cycles. It’s always best to work on hard to-do’s when your energy is at its’ highest. But if you are too tired, you may not reach your highest energy at any point during the day or it may only be brief. Hyperfocus can also disrupts a person’s intention to get exercise or eat well. You plan to go to the gym but you get involved in something else and when you check the time, you need to leave for an appointment. You want to prepare a good dinner but you need to “just finish this one task” and all of the sudden you need to be somewhere, so you stop for fast food on the way. Make it fun! Ride a bike at the gym while watching a favorite TV show or walk with a friend. Healthy food can be food you enjoy. Don’t think you’ll prepare a meal of food you don’t like! Make it easy! If the gym is a mile away you’re more likely to go than if it’s 8 miles away (unless it’s on the way to somewhere you need to be and you’re willing to take all of your grooming supplies with you). Create “semi-homemade” meals or hire a personal chef. If you feel overwhelmed by all of this information, don’t just ignore it altogether. Pick one facet of one area and get curious about how a small change in this one element could bring positive change in your life. Still not sure where to start? Minding Your Matters organizing and productivity staff are specifically trained to work with people who have ADHD. We’d be happy to become part of your support team! Contact us for details.